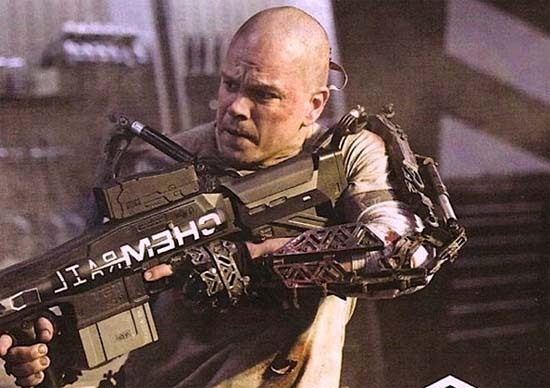 There’s a new pic out from the scifi film Elysium (by that District 9 wunderkind, Neill Blomkamp). This is of Max (Matt Damon), a low-life blackmailed into helping the rich orbital near-space-based overclass into keeping their society safe from all the dirt-poor groundworms on Earth. Sounds like an updating of the Eloi/Morlocks divide. In fact, Kim Stanley Robinson’s latest novel, 2312, has more or less the same plot at its core. It’s good, but door-stopper large, so am getting through it slowlyyyyy.